Starfish, Chicolate Chip Knobby (1-2"/25-50 mm) ea. Great Beach Crafts and Nautical Wedding Decor item. Can be left natural or dyed/painted. 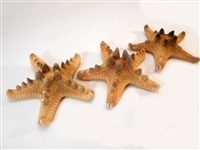 Starfish, Chicolate Chip Knobby (2-3"/50-75mm) ea. Starfish, Chicolate Chip Knobby (4-5" ea.